This project was originally created for the class 62-150 Intro to Media Synthesis and Analysis at Carnegie Mellon University in the Fall of 2016. It was orignally posted here. The demo is currently not available for download, however I intend on releasing it when I have access to a VR system again. The essential idea of this project is to translate the Op-Art works of painter Bridget Riley into an interactive digital museum. The museum is experienced in VR, using the HTC Vive. I believe VR is a perfect platform for this kind of project, as VR itself is an illusory medium. Some interesting fourth-wall-breaking connections can be made between the headset itself and Op-Art. VR further adds to the experience by contributing a sense of scale - large virtual objects actually appear large, which may not be immediately apparent on a computer screen. This is especially important when interpreting the works of Riley, who is known for the depth and scale she brings to her works. Additionally in a digital museum I can make objects behave in ways that are impossible in real life; this gives me a lot of freedom when curating the museum. Raymarching is a fairly new technique used to render realtime scenes. The technique is particularly interesting because it is entirely computed in a screen-space shader. In other words, no mesh data is provided to the renderer and the scene is drawn on a single quad that covers the camera’s field of vision. Objects in the scene are defined by an analytic equation that describes the shortest distance between a point and the surface of any object in the scene (hence the full name Raymarching Distance Fields). It turns out that with only this information you can compose some strikingly complicated and beautiful scenes. Further, because you aren’t using polygonal meshes (and are instead using mathematical equations) it is possible to define perfectly smooth surfaces, unlike in a traditional renderer. 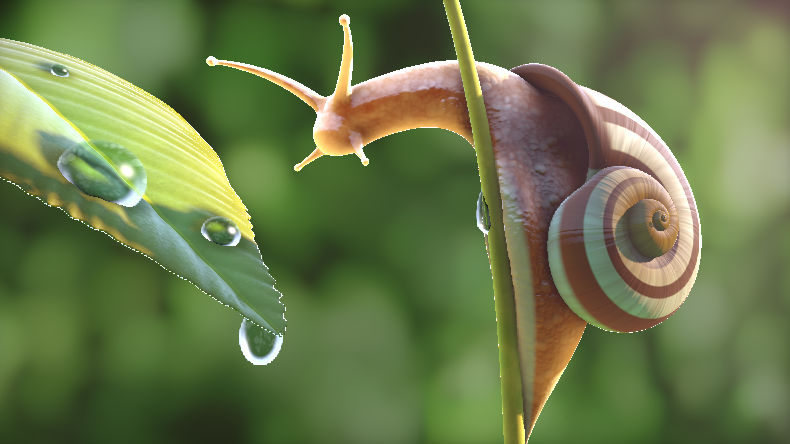 Snail by Inigo Quilez was created entirely using raymarching. You can find more examples of raymarched scenes on Shadertoy. This article will first discuss the fundamental concepts and theory of raymarching. Then it will show how to implement a basic raymarcher in the Unity game engine. Finally it will show how to integrate raymarching practically in a real Unity game by allowing raymarched objects to be occluded by normal Unity GameObjects. You can find a complete reference implementation at this Github Repository. From September 2014 to June 2016 I was the Project Lead and Lead Programmer on a Virtual Reality project at the Bergen County Academies (my high school) in collaboration with the the National Park Service’s Ellis Island / Statue of Liberty National Monument. 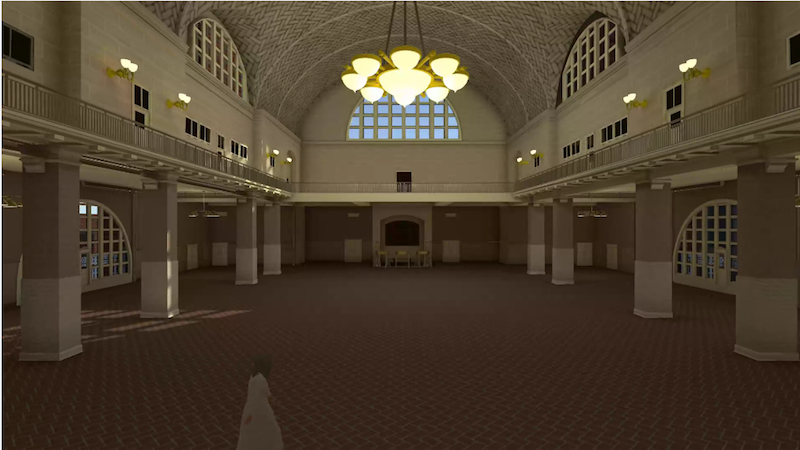 The idea of the project is to digitally recreate Ellis Island as it was between the years 1918-1924, to be viewed in a Virtual Reality headset. At the time of writing, the project supports Oculus Rift, Oculus DK2, and HTC Vive in both seated and roomscale paradigms. The project is still ongoing, and I passed it on to current students when I graduated in 2016. In this writeup I detail some of the systems that I developed for the project. Please note that the content here is in-development and in-beta and is subject to change. Here I present an easy-to-use teleportation system for the HTC Vive and the Unity game engine. The system is modelled after Valve's game for the Vive The Lab, a game where the player can traverse VR environments that are bigger than the play area. You can check out the project source code here on Github. The Github project is open source and licenced under the MIT licence. Here is a short demo reel of my proudest work that I created for undergraduate university applications. It highlights all of my major Github projects up to October, 2015. You can check out the video below. The original contents of this website are licensed by Adrian Biagioli (Flafla2) under a Creative Commons Attribution 4.0 International License.